I would probably try not to visit a country when it was going through a major debt crisis. 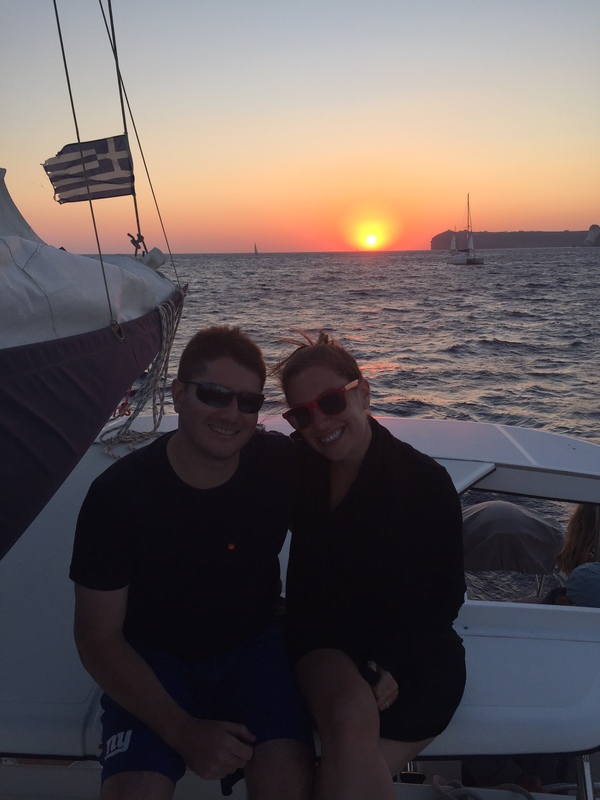 Of course, when we booked the trip we knew that Greece had serious financial issues. However, we thought the chances of the situation coming to a head when we were traveling in the country were slim to none. But we were wrong! Fortunately, the state of affairs in Greece had little to no effect on our experience as the locals more or less pretended it wasn’t going on. 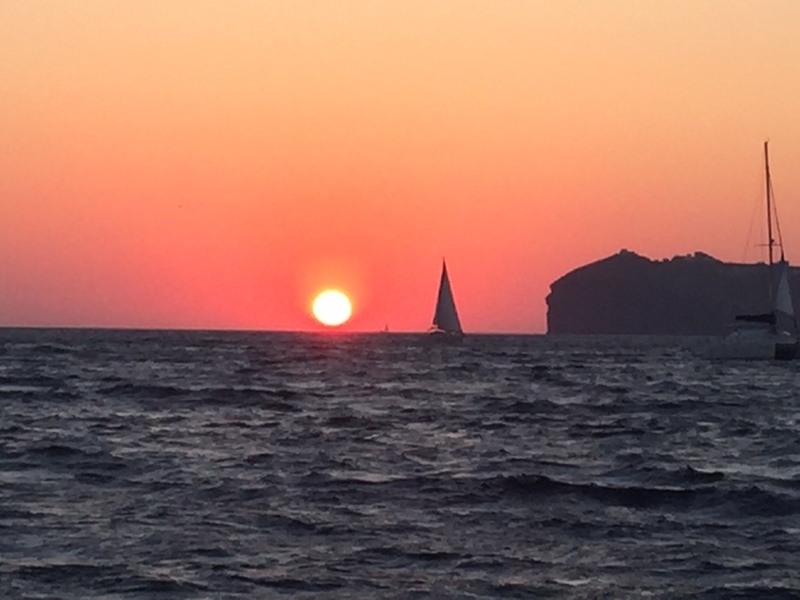 We booked hotels, transportation (to and from Greece and between Athens and the islands) and some excursions before. However, we’ve never been a big fan of making reservations for restaurants before I go to a foreign country. We generally like to walk around to find something great to eat and do not want to feel constrained to a timeline. We had no issue getting into any restaurant we wanted. We stayed at the Cavo Tagoo in Mykonos which was a hotel that cost way more than I’ve ever spent on a hotel (perhaps even double what I’ve ever spent). However, it was completely worth it. They treated us like royalty, immediately upgrading us to a two bedroom suite with a pool on the balcony. 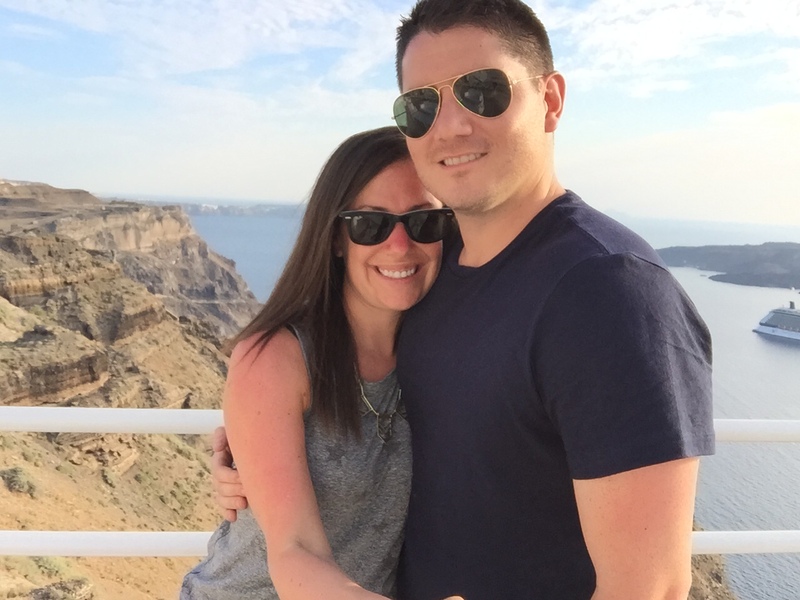 I still haven’t figured out what we would do with a second bedroom on our honeymoon? I want to take my husband to Spain, specifically Barcelona – I have been before and I know he would love it. Athens: Athens Gate Hotel — This was perfect for what it was. 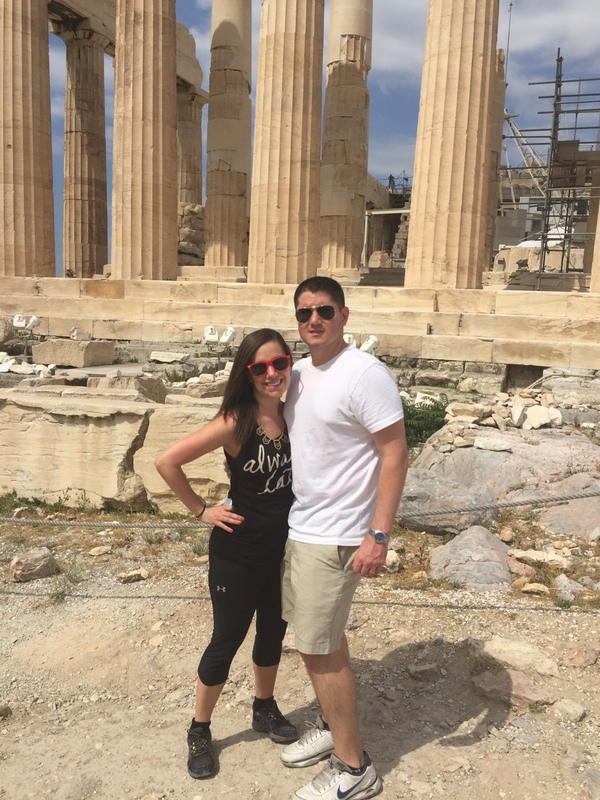 It was a hop, skip and a jump away from the Parthenon/Acropolis which we ran out to see first thing in the morning because it gets unbearably hot and crowded later in the day. Also, if you walk a few blocks away there’s a street that has a ton of outdoor restaurants. We had a view of Zeus’ temple from our room as well. 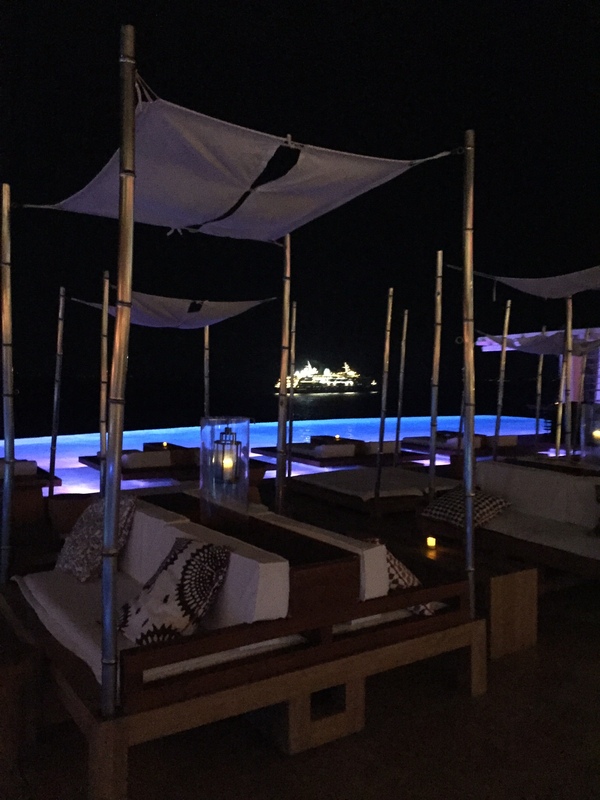 Mykonos: Cavo Tagoo — As I’ve already mentioned, I’m in love with this place. The pool scene was spectacular during the day. It was quiet enough but they played a low level of techno music (though certainly not enough to bother me), and I think I read about four books there. Also, they have these awesome sun beds (as opposed to lounge chairs) that we never had any trouble getting. Plenty of people had cocktails, champagne, or rosé during the day, but the best part was the food by the pool which was fantastic. They had a menu of “fancier” food (like if you wanted to have branzino during the day), but the sandwich/burger menu was out of this world. Moreover, the hotel’s inclusive breakfast buffet was amazing as well. It had Greek delicacies but also stuff that Americans crave like eggs, bacon, etc. You could walk to town from the hotel, although it was down a busy street so you had to hug the side of the road. If you preferred not to walk, the hotel also ran a shuttle service 24/7. Finally, (and this was VERY important to my husband), they had great cocktails which was definitely an oddity for Greece. Here’s a photo of the sunbeds at night when the pool became more club-like. Santorini: Adamant Suites — I picked this hotel because it’s basically one of the only hotels on the cliffs of Santorini that had a pool. 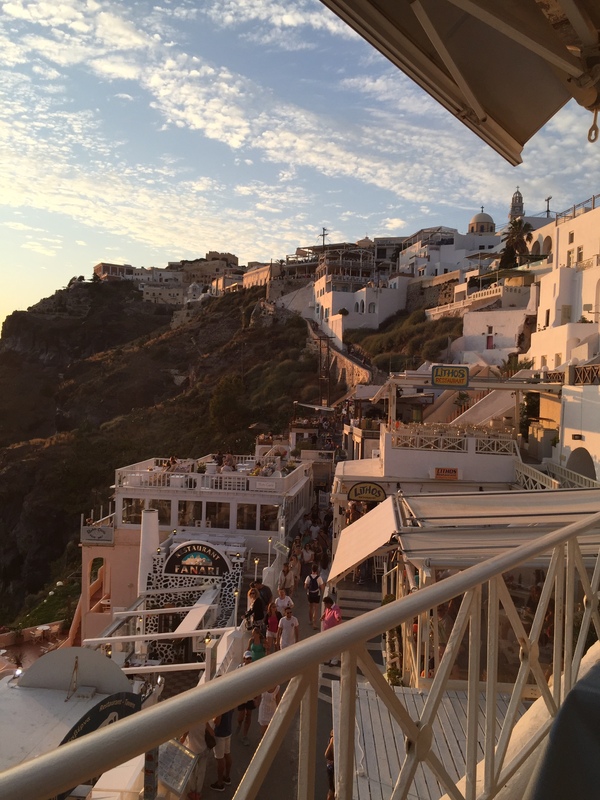 It was an awesome hotel overlooking the caldera and I loved being there, but was a bit too boring for my husband’s taste because Fira is definitely a quieter town than where we stayed in Mykonos. We could easily walk to town, but to get back to the hotel we climb about a thousand steps; that’s just part of the gig if you want to stay on the cliffs. I’d say the best thing about this hotel was the breakfast. Every night you’d place your order with the front desk for the next morning’s breakfast. You could get pretty much anything you wanted (and as much as you wanted), and the meal also included champagne or sweet red wine. It was delivered outside to our balcony the next morning at a predetermined time. Overall, the food in Greece was amazing. 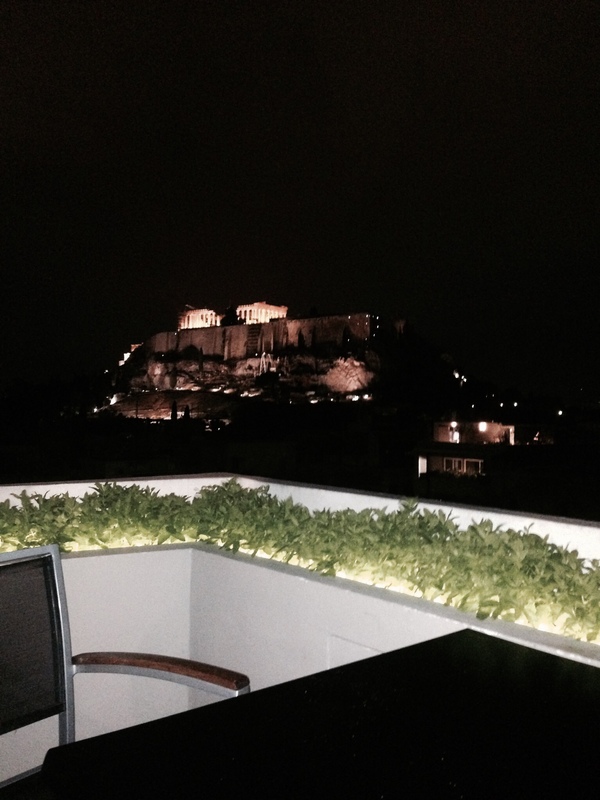 In Athens, we ate at a restaurant called Strofi where the tables had a view of the Parthenon. We each had goat prepared two different ways, and it was phenomenal. 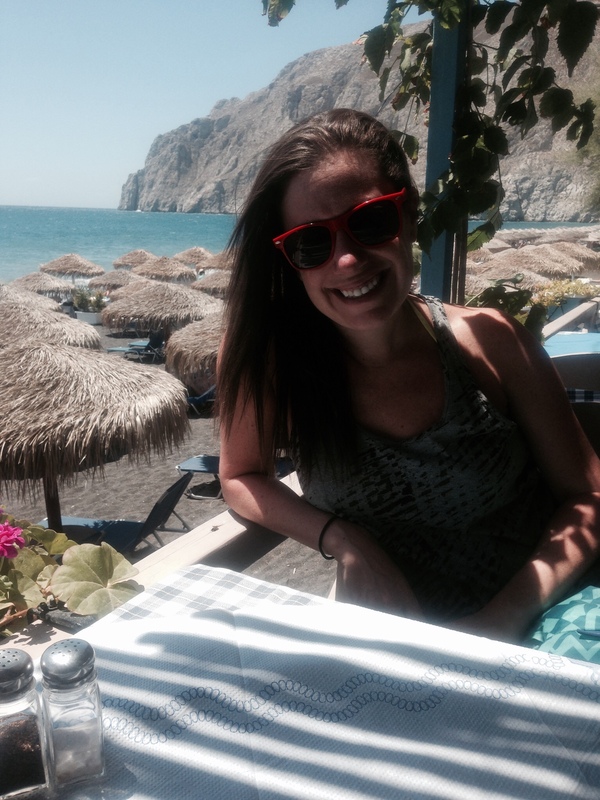 The other meal that stands out to me was in Mykonos at a place called Eva’s Garden. I had the Moussaka (the Greek version of lasagna) with Béchamel instead of a tomato sauce. They are known for it, and it was maybe the most delicious thing I’ve ever had. Other than that, the food was all fresh and we made sure to have grilled calamari/octopus at every restaurant we ate at for either an appetizer or an entree.